Installation Instructions for CP-2805 Weld-in Frame Adapter for Flathead Ford engine. Please read the instructions fully before starting. Kit requires installation of front boxing plates. Remove original engine, transmission and unneccesary brackets. Frame rails should be checked for twist or out-of-square condition and corrected. Once boxing plates are installed, trim engine mount frame adapters to fit. Tack-weld these adapters in position flush with top of frame. Double check measurement and mounting before finish welding. 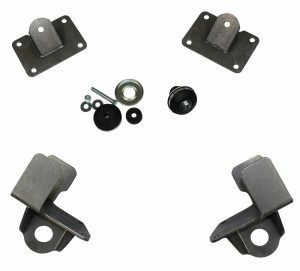 Transmission mount and crossmember will vary with type of transmission used.